As AOL pours $50 million into its hyperlocal news site Patch.com to expand its sites around the country, smaller competitors are maintaining confidence that their platforms can survive AOL’s aggressive content strategy. Outside.In CEO Mark Josephson told GigaOm recently that he welcomes Patch into the space, because the site provides more content for his hyperlocal news aggregator to source. But what about the future of existing, local news sites in cities, such as the Tribune’s ChicagoNow, which has a similar model to Patch? While Patch hasn’t reached Chicago yet, we hear that it will be arriving soon. So is there room for a few hyperlocal news sites in one city? Digital VP for the Chicago Tribune Bill Adee says yes. In fact, ChicagoNow has seen considerable success since its launch last August. ChicagoNow, the brainchild of Adee and Editorial DirectorTracy Schmidt, is a network of 350 blogs from individuals all around greater Chicago that report on local happenings trends, events and community news. Bloggers are incentivized to write by earning $5 per 1000 local page views. While the site has a number of editors, the content is purely generated by the bloggers. And editors don’t proofread any of the content; bloggers have the power to post whatever they’d like. That being said, ChicagoNow requires that writers sign an agreement taking full legal responsibility for any content written in their posts. On the content side, blogs range from ArtTalkChicago to Chicago Baseball Stories to Chicago Political Commentary. While bloggers provide the content, editors help with SEO, socializing content, SEO, and interlinking of content. ChicagoNow even holds educational blogging seminars for its contributors. Besides traditional display advertising, ChicagoNow also offers advertisers the ability to post “adverblogs,” which is sponsored content from local advertisers. One of my criticisms of the site is that it seems difficult to navigate, and content is not streamlined. But ChicagoNow is completely redesigning its site with a more powerful search technology, courtesy of Loud3r. Not only is the site’s search is getting an overhaul, but the entire site has been redesigned with a sleeker, more user-friendly interface. In March, ChicagoNow saw 1.5 million unique visitors and 15.5 million page views according to Omniture. Adee says the company has grown every month in terms on unique visits. That’s not too shabby, considering that site is still fairly young and experimenting with a new model. 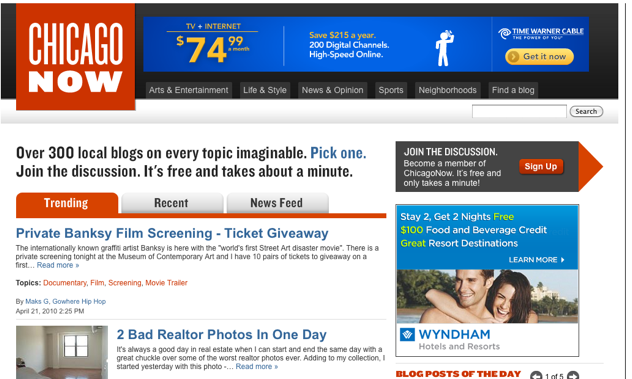 So is ChicagoNow’s model the magic formula to hyperlocal news? Schmidt says that there’s more than one model that will work in terms of serving relevant content to local audiences. But she does highlight the fact that the site allows both bloggers and visitors to discover localized content that is interest-focused on niche topics within a community, such as public schools, neighborhood crime, jazz in Chicago, healthcare in the area, public transportation and more. It’s important to note that the Chicago Tribune and the Tribune Company are investing money and resources into developing a homegrown hyperlocal news initiative as opposed to acquiring a local or national site or model that is doing the same thing. AOL acquired Patch for $7 million last year and MSNBC acquired hyperlocal news aggregator EveryBlock. It should be interesting to see how ChicagoNow fares when Patch does arrive, with its war chest of funding. ChicagoNow also faces competition from the Chicago News Cooperative, which provides local news and coverage of the Chicagoland area for The New York Times.